I remember going to the Auschwitz museum for the first time when I was about 10. It was a horrible experience; I had nightmares for a long time after. I would never recommend anyone taking there children there. Later on, I visited Auschwitz a few more times and still it was very difficult each time. I can’t believe it happened. Or I should say it has taken place recently in Europe! Then we were taken to Birkenau by bus, a place where everyone was “delivered”, selected (so strong people had to work), as you can see in The Schindler’s List, where they lived… and were killed. They worked in factories and plants in the Upper Silesia industrial region and other nearby areas that were important to maintaining the German war potential located nearby. If the transport (of prisoners) was delivered to the overcrowded camp, there was no selection, everyone was sent “to have a shower”. They lived in wooden stable-type barracks, built originally for 52 horses, and had a total capacity of more than 400 prisoners per barracks. In reality there were about 7 people sharing a bed, not enough toilets and no heating. The barracks were frequently damp, and lice and rats were an enormous problem for the prisoners. The last place you are taken to, which is on the other side of Birkenau, a place for extermination, it was partly destroyed by the Nazis escaping in late 1944, and trying to destroy any evidence of the genocide. 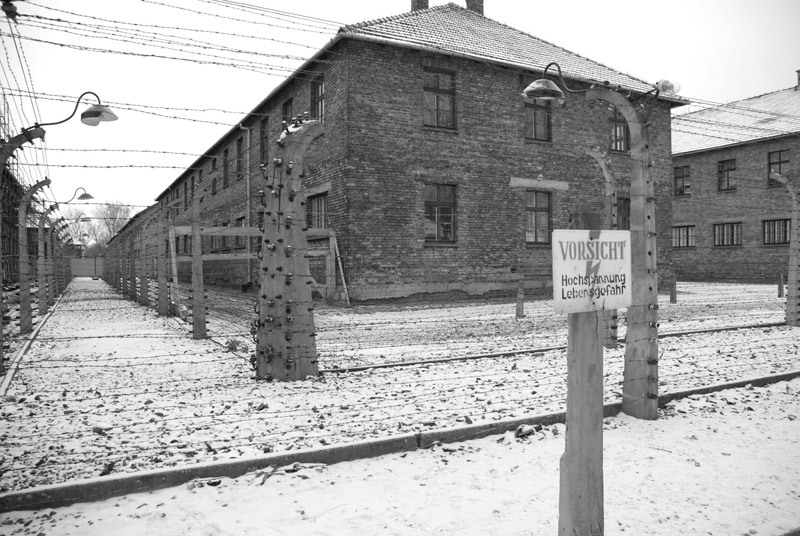 All over the world Auschwitz has become a symbol of terror, genocide, and the Holocaust. It was established by Germans in 1940, in the suburbs of Oswiecim, a Polish city that was annexed to the Third Reich by the Nazis. Its name was changed to Auschwitz, which also became the name of Konzentrationslager Auschwitz (concentration camp). The direct reason for the establishment of the camp was the fact that mass arrests of Poles were increasing beyond the capacity of existing “local” prisons. Initially, Auschwitz was to be one more concentration camp of the type that the Nazis had been setting up since the early 1930s. It functioned in this role throughout its existence, even when, beginning in 1942, it also became the largest of the death camps. The first and oldest was the so-called “main camp,” later also known as “Auschwitz 1” (the number of prisoners fluctuated around 15,000, sometimes rising above 20,000), which was established on the grounds and in the buildings of pre-war Polish barracks. The second part was the Birkenau camp (which held over 90,000 prisoners in 1944), also known as “Auschwitz 2” This was the largest part of the Auschwitz complex. The Nazis began building it in 1941 on the site of the village of Brzezinka, three kilometres from Oswiecim. The Polish civilian population was evicted and their houses confiscated and demolished. The greater part of the apparatus of mass extermination was built in Birkenau and the majority of the victims were murdered here. The Germans isolated all the camps and sub-camps from the outside world and surrounded them with barbed wire fencing. All contact with the outside world was forbidden. However, the area administered by the commandant and patrolled by the SS camp garrison went beyond the grounds enclosed by barbed wire. It included an additional area of approximately 40 square kilometres (the so-called “Interessengebiet” – the interest zone), which lay around the Auschwitz 1 and Auschwitz 2-Birkenau camps. The local population, the Poles and Jews living near the newly-founded camp, were evicted in 1940-1941. Approximately one thousand of their homes were demolished. Other buildings were assigned to officers and non-commissioned officers from the camp SS garrison, who sometimes came here with their whole families. The pre-war industrial facilities in the zone, taken over by Germans, were expanded in some cases and, in others, demolished to make way for new plants associated with the military requirements of the Third Reich. The camp administration used the zone around the camp for auxiliary camp technical support, workshops, storage, offices, and barracks for the SS. What most people cannot realise until they visit these places is the sheer size of the camps. In the case of Auschwitz & Birkenau they were literally huge and covered the same footprint as a medium sized town. I have been to Bergen Belsen which lies in the British Occupation zone when I was stationed in the army in Germany in the 1980’s and that being one of the smaller camps was horrific enough but they would not allow us to cross the border (which was the iron curtain in those days) to visit the camps in Poland. The one thing that struck me about Belsen was the quietness of the place. When the British Liberated the camp in 1945 many of the occupants were close to death and there was very little they could do to save them. Typhoid and other diseases also broke out. As a consequence they had to carry out mass burials in pits. Today those pits stand as memorials to the horrific acts that took place and the most eerie thing I thought was the absolute silence not even any birdsong in the vicinity. This site is an excellent resource for learning more and what the camps looked like then and today. I have recently been to the Dachau Concentration Camp near Munich in Germany. It was the first to be built, and lasted throughout Hitlers reign. I was deeply moved by the images and literature in the museum, and was shocked at the size of the grounds, and how many people were forced into this terrible place, and how many lost their lives, and the manor in which they lost them. Auschwitz is somewhere i intend to visit soon as i think the film, ‘Schindler’s List’, is very powerful, and i want to see it for myself. As mentioned above, its hard to believe these sorts of things went on at all. Great post. I visited Auschwitz last June. Was an incredibly hot day that felt even more wrong (kind of expected a gray day) as the contrast to a beautiful and sunny day with the horrors of the place was even more distinct. I felt most upset at the one on one killing that took place. So cruel. I was also outraged a group of schoolgirls sucking lollypops and texting. Otherwise a sobering and necessary trip. I have been to Auschwitz and Auschwitz-Birkenau a few times and boy, does the history smack you in the face. On a stranger note, I once had a taxi driver there who drove around all the cast of Schindler’s List. He had a photo of him and Liam Neelson, Steven Spielberg on his dash. Great post. I have never been to Auschwitz. However, after reading your post I wish to visit the place soon, and write about the same in my travel blog. When I visited Aushwitz-Birkenau, it was March and we saw similar conditions to your October visit. My friend and I were wearing all of the clothes we owned and were still cold. The trees were barren and there were no tourists. All of this made the experience even more shocking – if we were cold with all of our clothing and down jacket, how did those prisoners survive? Thanks for doing such a thorough job with the research aspect. It was interested to read your perspective as a Polish woman. I lived in Zakopane for a few years, and that’s close to Auschwitz. The first time I visited that place I was upset for weeks. What a horrible place. Hi Josie, I think anyone of any age should go to get a better understanding of European history. It’s great to increase awareness over some of the atrocities which happened in the past which will hopefully ensure things like that don’t happen again. Auschwitz is indeed a sombering site. I visited in 1993 and the memories are still strong in my mind. Seeing that room full of the bags, shoes and possesions of the people based there helps you to appreciate the scale of the camp. The gas chambers and the room where the bodies were disposed of were spine chilling. Whilst visiting I was overall quite numb in my emotions. I think it was a protective and subconscious mechanism to protect me. Even now when I think of what took place, it is too awful to fully digest.